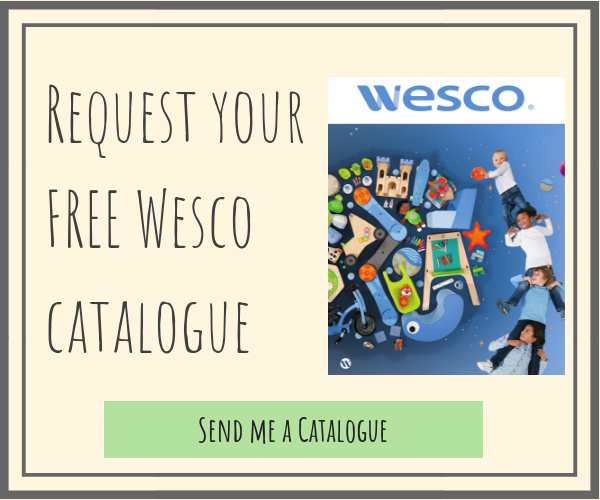 The outdoors is a special playing and learning environment for all children: a place of unrestricted choice of movement and immersive sensory experience where aesthetic qualities are more vivid in a natural world of infinite space. 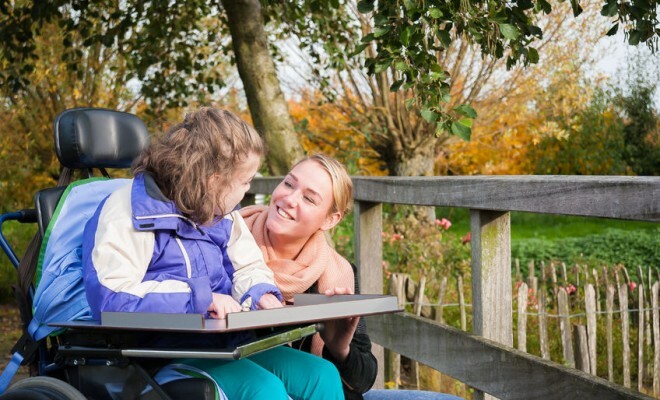 And, when considering disability and inclusion, childcare professionals report that, for those children with individual needs and complex disabilities, contact with the outdoors is almost guaranteed to produce stronger responses than the levels normally exhibited during indoor play. If you’re considering re-designing your outdoor space, be sure to make an appointment with one of our expert advisors. This outdoor model of provision clearly seeks to fulfil the requirements of article 23 of the United Nations Committee’s Rights of the Child (UNCRC) document which sets out the right of all disabled children to ‘enjoy a full and decent life’. However, as Casey (2011) has shown and Figure 8.1 illustrates, the UNCRC notion of inclusive play can itself be subject to a range of nuanced interpretations both in legislative documents and guidance issued by different organisations, and in different childcare settings. 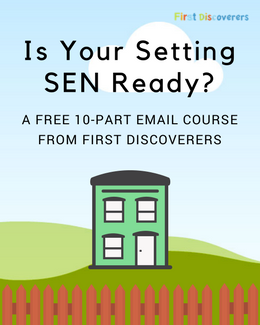 Sometimes opportunities for access and participation are prioritised, whilst elsewhere the focus may shift to removing exclusive barriers or providing the fullest possible inclusive play experience. 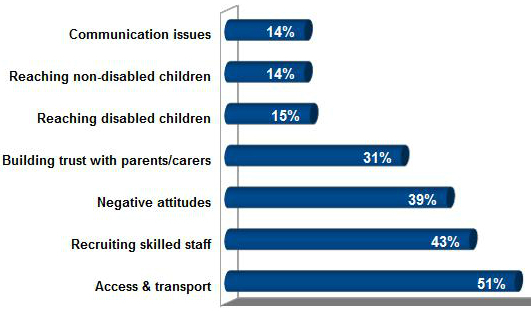 One result of this variety of emphasis, clearly highlighted in the Barnardo’s ‘Lets play together’ report (Barnardo’s, 2005), is that even the best inclusive play provision ‘where diversity is respected and valued’ and which enables ‘all children of all abilities, ethnic backgrounds, ages and other differences, to play together’ will have ‘barriers which must be overcome’. 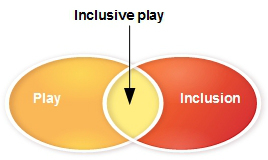 As the report’s authors point out and summarise in graphic form (see Figure 8.2), there can be many practical reasons why ‘inclusive play is not merely about inclusion’ – their research evidence encompassed some settings which fell short of this ideal and ‘provided high-quality play, but were not inclusive (in terms of children playing together)’, while others were ‘inclusive, but did not necessarily enable children to play’. 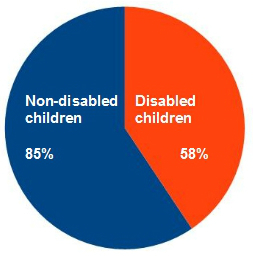 Nevertheless, according to the Barnardo’s data, 60% of their surveyed project settings (a total of 39 locations) were successful in increasing the numbers of disabled and non-disabled children playing together. But where such efforts failed to achieve this outcome the primary reasons were practical/administrative issues related to transport and staffing (see Figure 8.3). 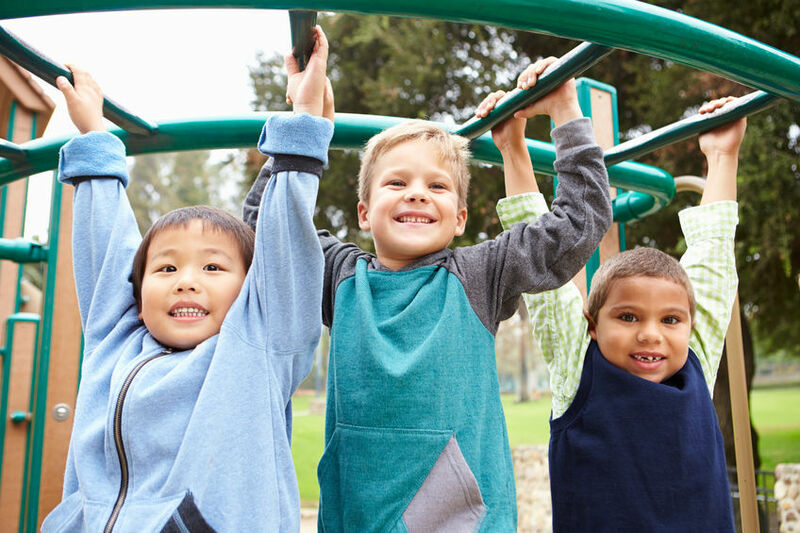 Furthermore, study evidence from the Barnardo’s project also mapped the number of children able to make new friends (see Figure 8.5 below) as a direct consequence of inclusive play opportunities, and reported that ‘the longer disabled and non-disabled children spent getting to know each other … the more likely they were to interact and play together’. 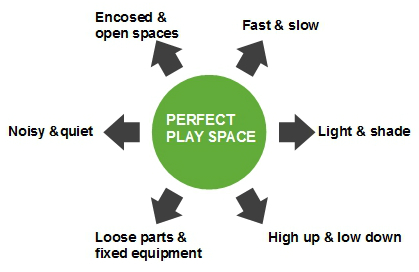 Juno Hollyhock, executive director of Learning Through Landscapes, has also addressed the issue of inclusive outdoor spaces and suggests six contrasting environmental parameters (see Figure 8.6) she considers necessary to ‘create spaces that have opportunity and potential for all children regardless of their ability’. 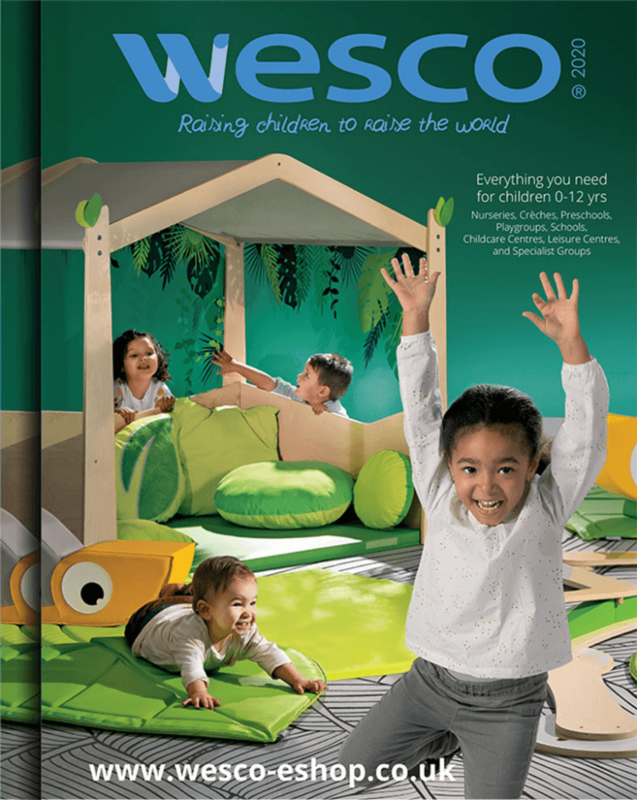 In this model, choice is the essential feature: those with cognitive or sensory impairment may sometimes prefer quiet sheltered areas with contrasting light and textures; a range of different surfaces and levels can facilitate participation for those who need mobility assistance; children with hearing impairments will appreciate quieter spots with face-to-face seating which makes communication with others so much easier; and a variety of fixed equipment and seating can also double as ‘traffic management’ devices, creating calmer backwaters as a welcome contrast to the ‘all-action’ open spaces. 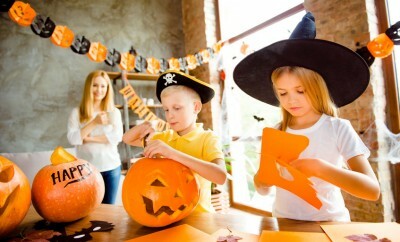 the inclusion and identification of areas, resources and activities which can offer a controllable measure of risk and challenge and which can be enjoyed by any child, with or without impairments – bearing in mind, of course, that an impairment can significantly alter the degree of challenge such features may present. 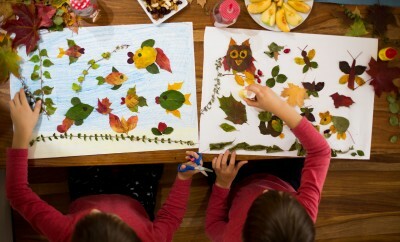 Considering the types of play favoured by different children, a small-scale study by Hestenes and Carroll (Figure 8.7), involving both typically developing children and those with delayed development or visual impairment, indicates that each of these groups showed a clear preference for similar types of play activity. 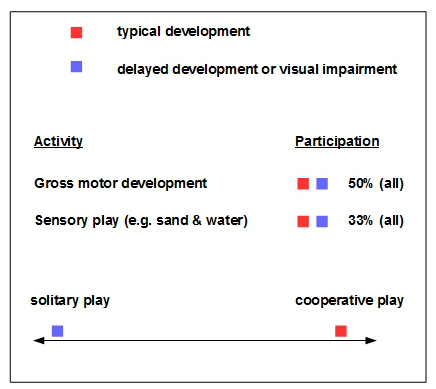 However, as the diagram shows, there was nevertheless a distinct divergence in engagement with solitary and cooperative modes of play. 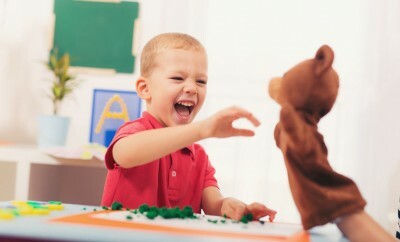 As regards playing together and mutual understandings, researchers noted that the extent to which the typically developing children recognised, or could predict, the needs and difficulties of the children with disabilities influenced their efforts to engage in playing together. 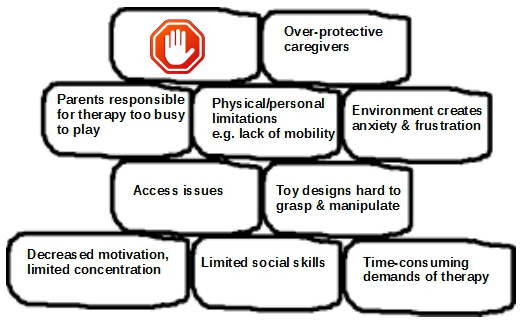 Though such considerations may inhibit some aspects of participation, the tactful support of skilled playworkers and childcare professionals can do much to ensure those with ASD impairments are still able to access and positively experience many of the important benefits of outdoor play.